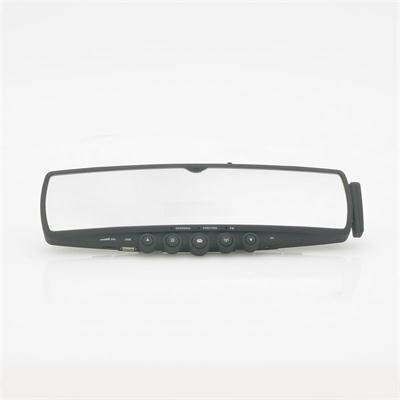 Successfully Added Bluetooth Car Rearview Mirror - MP3 Player, FM Radio, Mini LCD to your Shopping Cart. This Bluetooth Car Rearview Mirror is smart and safe, allowing you to keep your eyes on traffic while making and receiving handsfree calls. Simply snap it over your existing rear view mirror and you are ready to hit the road! Making calls with this unit couldn't be simpler, a few button presses is all it takes to setup the unit, then you can start using the button controls or handsfree functions for phoning while on the road. The Bluetooth LCD view screen is embedded inside the mirror and only lights up when there is action, so there is no blind-spot when you are checking out what's behind you on the super wide racing style mirror panel. This unit also plays radio via the built-in speaker or sends music from a SD card or USB flash drive over FM signal to your car stereo or included Bluetooth earpiece, so you can take your favorite music with you wherever you choose to go. 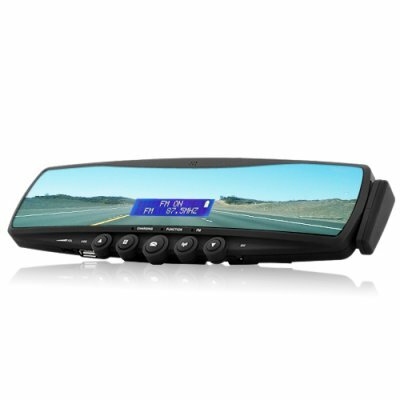 Equip your car with this great Bluetooth Car Rearview Mirror for convenience and security. It is brought to you at an amazing low price by the leader in car accessories and electronics, Chinavasion. Easy DIY installation. Snap on vice grips with rubber pads securely fasten over existing mirror. Bluetooth device with wide angle mirror for maximum safety. Detachable Bluetooth earpiece for call privacy. Backlit LCD shows call information when making or receiving call. LCD hides behind mirror when not in use. Built-in speaker and MIC, plus Bluetooth earpiece for conversation privacy. Great products. I was always on the road for my work. This word of been perfect.